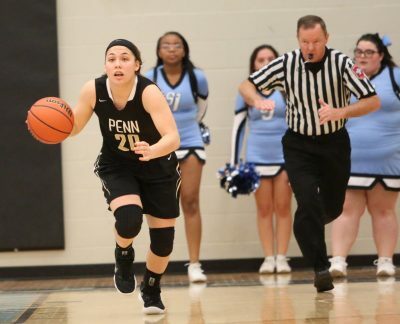 The Penn Kingsmen Girls’ Basketball team has seen great success this season, putting up a record of 20-1 so far this season. The leadership of Sara Doi, a senior point guard, has been a huge part of the team’s prosperity. Doi, a 5-foot-5 Huntington University recruit, leads Penn with 13.3 points a game. She averages 3.9 rebounds a game, and 2.9 steals and 2.9 assists a game. Doi, who was a key player on Penn’s 2016 State Championship Team, learned leadership from some outstanding players on previous Kingsmen teams. These intangibles are what can a make a good player great. Doi has definitely already seen her share of wins at Penn. In her four seasons on the varsity, the Kingsmen are 90-13. Doi said that the State Championship experience showed her what the expectations are every year for the program. The experience also showed her how much work it really takes to win a state championship. This year, as the senior leader, Doi has definitely shown everything she’s learned over the years. This season, Doi is counted upon to lead a Kingsmen backcourt that features two freshmen in the starting line-up, Jordyn Smith and Trinity Clinton. “They are becoming more understanding of different situations that most freshmen would struggle in and they have kept composure in big games where most freshmen would be too scared to perform,” Doi said of the way Smith and Clinton have made an impact on Penn’s success. With the way the team is improving, Doi feels confident that the Kingsmen can accomplish their goals. Penn has already won the Northern Indiana Conference Championship, and the Kingsmen are the highest ranked team in the Sectional. Doi believes that the Kingsmen can make another good run in the state tournament. With such a fantastic leader of the team like Doi, it’s hard to think any other way.